In contrast to the contemplative, peaceful character of Beethoven’s Sixth Symphony, disharmony and contention was rife everywhere around it. Not only was the very first performance bungled and criticised by musical 'clairvoyants' of the day who saw their vision of a heroic musical titan fade away in the sensitive melodiousness of the music, but the never-ending question of whether this is programme music or absolute music was raised continuously. The interpretation is quite another matter, however. The “Pastorale” Symphony is a real challenge and test for every orchestra when it comes to producing a refined sound and finely graded changes of tempo. 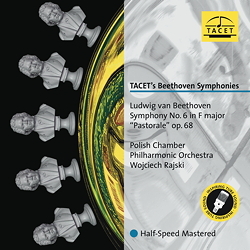 Here, Wojciech Rajski and his Polish Philharmonic Chamber Orchestra – who have won international acclaim for their Beethoven recordings – are in their element. With a succinct yet differentiated sound colouring in the strings in all registers, the ensemble treads lightly through the picturesque landscape, carefully weighs in each melodious figure, and produces crackling, sparkling tension through sensitive changes of tempo. In the Finale one can quite justly speak of an abundance of gorgeous sound, and one must certainly be thankful for the use of tube technique that results in such wonderful sound in this studio recording.